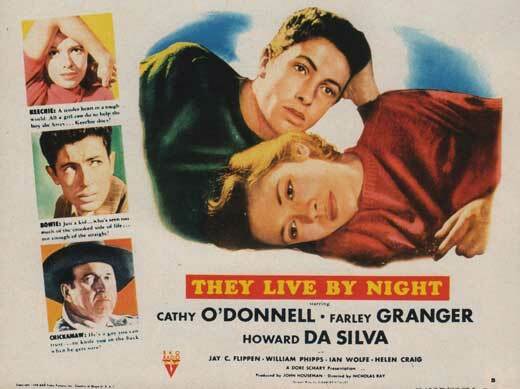 They Live by Night is a classic film noir based on Edward Anderson book Thieves Like Us. This film starts out with a quick scene before the credits role of our happy couple. We than flashback to three men in the process of a prison escape. We see Granger and his two cohorts played by Howard Da Silva and Jay C. Flippen. There is an interesting scene here, where Ray shot from a helicopter for a bird’s eye view of our trio fleeing. This is one of the first action scenes ever shot from a helicopter(pretty amazing idea for a first time director). As our hero has a bum foot or ankle, he hangs by a billboard as his fellow escapees move on to their destination and will send help back for him. When a truck pulls up we meet Cathy O’Donnell as the farmer’s daughter there to take him to meet his friends. We can see the attraction right away between our two leads as she drives him to her father’s farm. As the trio regroup they decide the best move is to rob a bank to raise some money to make their getaway. Will they succeeded? Will our happy couple live happily ever after? 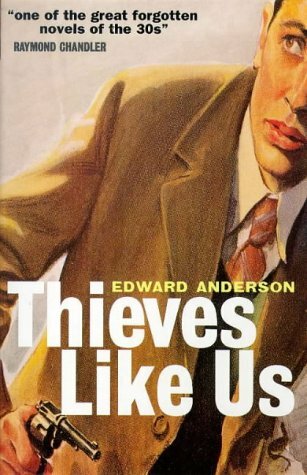 I’m not sure if Edward Anderson wrote this story as a fictional tale of Bonnie and Clyde or not, but it at least had to be a huge influence. This is a twisted love story in more than a few ways. This film is a must see for film noir fans, though I would not rank it among my favorites and maybe my expectations were to high going in. This is a good film and when you know it is Ray’s first film, I do appreciate it. I hope to read the book on which this film is based someday and revisit this film again. Favorite Tidbit: Another film was made in 1974 based on this novel as well. It goes by the novel’s title Thieves Like Us and stars Keith Carradine and Shelley Duvall. I have not seen this film but may have to watch both of these films back to back for an interesting double feature. It’s very well worth a watch.